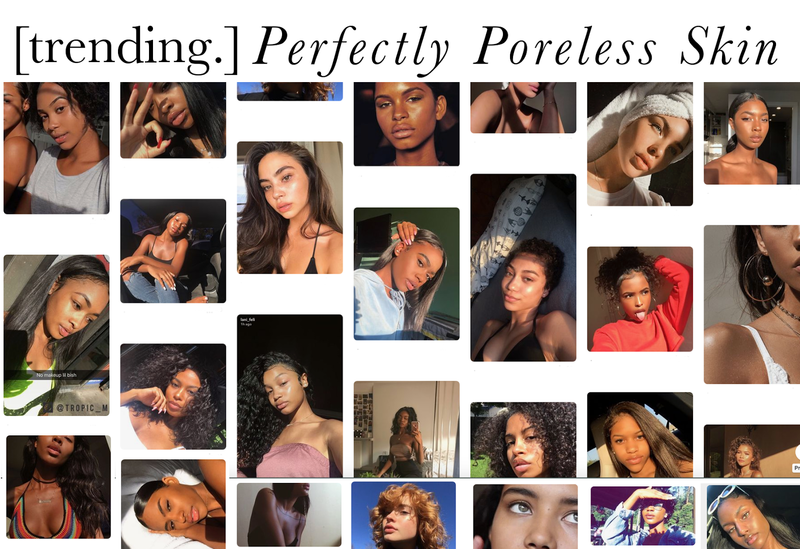 Is it just me or have you noticed the flawless skin trend on Instagram? Not too long ago my feed was saturated with heavily contoured faces coupled with an opaque matte lip. Slowly, things started to shift and everyone wanted to show off their bare face. Once these skin selfies started gaining traction, my timeline became flooded with image after image of the most beautiful skin I've ever seen. My prediction is that perfectly poreless, glowing skin will be huge this spring & summer. We need to get ready. I've been on my skin perfecting journey for a while now. Currently, my skin is doing ok, so I was going to chill for a bit. But I realize that there's still work to do so I must keep trekking forward. There's no slowing down until I reach my ultimate goal of achieving skin that looks absolutely extraordinary without a stitch of makeup. Once that foundation is built, wearing makeup will only enhance the final look. So let's discuss what we need to do between now and spring to experience near-perfect skin. I'm not going to expound. I'm just going to acknowledge that all of us have probably been drinking way less water than we should over the past few months. It's time to get back on track. 2. Nourish with veggie juices. Days ago, I watched a video on Youtube of featuring 3 individuals. All three of them are avid juicers and consume more green juice than most our water intake. One thing they all had in common was they appeared to radiate with a healthy glow from the inside. Some of us have experienced this glow first hand after a juice cleanse. Our skin responds to nourishment. Even if you can't do a full fast/cleanse, just add them to your current regimen. Maybe some beet juice here and there or perhaps an apple cider vinegar lemonade tonic. I'm bringing chlorophyll water back into my daily routine because the benefits were too good pass up. Figure out ways to incorporate more greens into your diet and do it consistently. If you're battling active acne, I suggest you give this regimen a try. Basically, homegirl cleared up her skin in a major way simply by incorporating black soap, witch hazel, and rose water spray. Speaking of witch hazel, I've seen this miracle toner praised for its acne fighting abilities by countless individuals. Yesterday, I picked up some witch hazel cleansing pads that I can swipe over my face, neck, shoulders, and back. I'm determined to do everything in my power to keep breakouts from forming. I've come to realize that treating congestion below the skin's surface is a powerful strategy that helps keep my skin clear. If I allow too much time to pass without deep cleansing, I'm setting myself up to experience breakouts down the line. -Making sure I cleanse with my Clarisonic instead of using my bare hands. -Steaming regularly using the white head elimination method. -Masking frequently to clear pores. Listen sis, if you don't include regular exfoliation in your regimen, you will not get the type of results you're looking for. Glowing skin is the result of light reflecting off young, healthy skin cells. Unfortunately, as we get older, our skin becomes stagnant and needs our help to remove old, dead, skin. Yes, you can layer on a bunch of highlighters to create a similar effect, but why not create skin that glows in the sun naturally? Play around with the type of exfoliators that your skin likes. Just know that almost every single one of your flawless skin inspirations probably exfoliates her skin on a very regular basis. Lastly, let us never forget the amazing wonders of well-moisturized skin. I don't touch on this subject enough. Those of us with oily skin don't do a great job of moisturizing because we think it's not necessary. This way of thinking is highly flawed and downright dangerous. I was walking around with dry, oily skin for a long time because I thought using hydrating products would worsen the situation. Once I learned how foolish I was being, I focused on moisturizing and my skin went from greasy to glowing. Lastly, I encourage everyone to acquire makeup that perfectly matches your skin. I remember watching a bunch of Fenty Beauty reviews where people were shocked to discover that their current foundations weren't as close to their skin tone as once thought. I was one of those people. Prior to discovering Fenty foundation, I tended to go for shades with red undertones. Then I was told I had yellow undertones and my world was flipped upside down. When you find a perfect match foundation, you can rock a truly no-makeup-makeup look. Just a little concealer, gloss, brows and suddenly, you become that girl who glows with very little effort.